Warrel Dane. One only needs to take a quick look at my Nevermore-reviews on this site to see that I am quite the fanboy of his. One of my favourite vocalists, bar none. It can be therefore questionable to have the man’s first solo album reviewed by someone who will undoubtedly have big expectations towards the piece before hearing a note. Although I must say, before the release I got slightly worried when hearing that Dane’s affections towards gothic music would be displayed heavily. I don’t dig the goth. It didn’t help when I heard that the album’s co-producer, former Soilwork-guitarist/nowadays full-time producer Peter Wichers, would play a big part in the songwriting process. Despite these questionable conditions, I waited for this album with great hopes. Dane himself said before the release that the direction in songwriting would go in a much more straightforward direction when compared to Nevermore, and so it has. The opener When We Pray chugs along with a grooving mid-tempo riff and leads to a very catchy chorus, where Dane’s vocals really sore with power and flawless technique. But from there on the first half of the album is stuck in the mud. The chug-riffs continue, the melodies aren’t all that good and too many of the songs have a vibe of latter-day Soilwork, which to me translates as pretty much boring. Tracks like Messenger, Obey and August do very little for me with the exception of Warrel’s singing. The hooks just are not there most of the time - the melodies don’t stick. Then from the seventh tune, Your Chosen Misery, acoustic and clean guitars take over more and the atmospherics are amped up considerably. Dane’s vocals are dripping with emotion and the feeling of a storyteller recanting tales from a very rich path of life. The few moments when the group ups the tempo, like on The Day The Rats Went To War and Equlibrium, it produces some of the best work on the record. The production job is great throughout with all the instruments in balance. 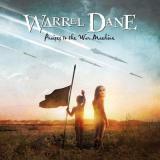 Overall, Praises To The War Machine is unfortunately mostly what I feared it would be – a collection of very good to very bland songs laced with the breath-taking singing of Warrel Dane. I think I would have liked the album a lot more if there had been more acoustic songs with just a very frail atmosphere and Dane hovering overhead. With a lesser singer, this album would easily score in the low 60s in my mind. The one thing I have not been able to stop thinking about, is this album’s relation to the upcoming solo debut of Nevermore guitarist Jeff Loomis. Will that particular album be a collection of brilliant instrumentals with riffs, twists and hooks to spare, just void of magnificent vocals? The likes of say, Warrel Dane's? I know solo projects should be held separate from the established band and seeing artists do different things out of their home bases is an exciting thing, but when the results are not that titillating, I can’t stop the speculation. Neither have I been able to fully get into this album, no matter how hard I have wanted to.